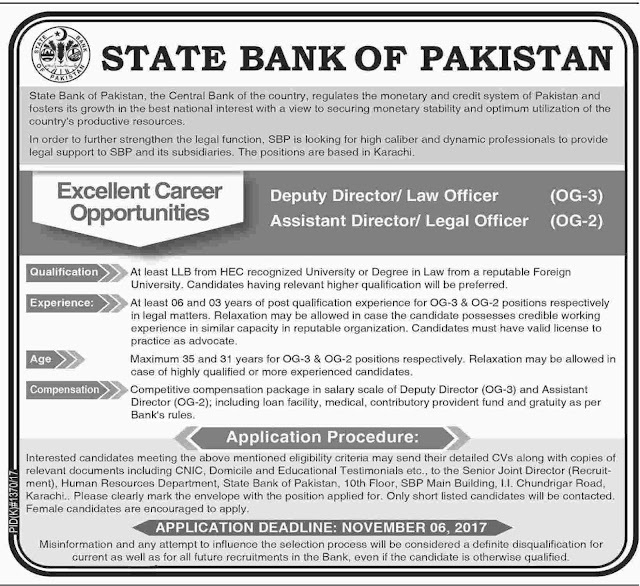 State Bank of Pakistan, the Central Bank of the country, regulates the monetary and credit system of Pakistan and fosters its growth in the best national interest with a view to securing monetary stability and optimum utilization of the country's productive resources. In order to strengthen the legal functions SBP is looking for higher caliber and dynamic professionals to provide legal support to SBP and its subsidiaries. These positions are permanently based at Karachi. At least 06 years and 03 years of post qualification experience for OG-3 and OG-2 positions respectively in legal matters. Relaxation may be allowed in case candidate possesses credible working experience in a reputable organization. Candidate must have a valid license to practice as advocate. Maximum 35 years and 31 years for OG-3 and OG-2 positions respectively. Relaxation may be allowed in case of highly qualified and experienced candidates. Interested candidates meeting the above eligibility criteria may send application alongwith detailed CV's and copies of relevant documents detailed CVs, to Senior Joint Director (Recruitment), Human Resources Department, State Bank of Pakistan, 10th Floor, SBP Main Building, I.I. Chundrigar Road, Karachi. Please clearly mark the envelope with the position applied for. Only short listed candidates will be contacted. Female candidates are encouraged to apply.